The name of Tatar national dishes echpochmak literally means triangle. Prepare the triangles of dough, although permitted, and fresh, and the filling is lamb, fresh potatoes and onions. 15 g of dry yeast. In a small bowl pour warm water or milk. The temperature of the liquid must not exceed 50 ° C, but not below 45℃. Put it in milk or water, sugar, dry yeast, gently sprinkle on the surface, give them a few minutes to soak and beat with a whisk. In a large bowl sift slide the flour with the salt. Pour into it first the oil and then the yeast. If you have a food processor or mixer, knead the dough, put the nozzle hook. If you prefer to knead the dough with hands, place on table and knead thoroughly, crushing the edge of the palm to the middle. Gather dough into a ball, put in a container and cover with a clean towel. Remove the bowl of dough in a warm place for 40-60 minutes. The optimum temperature for test is 25-27оС. 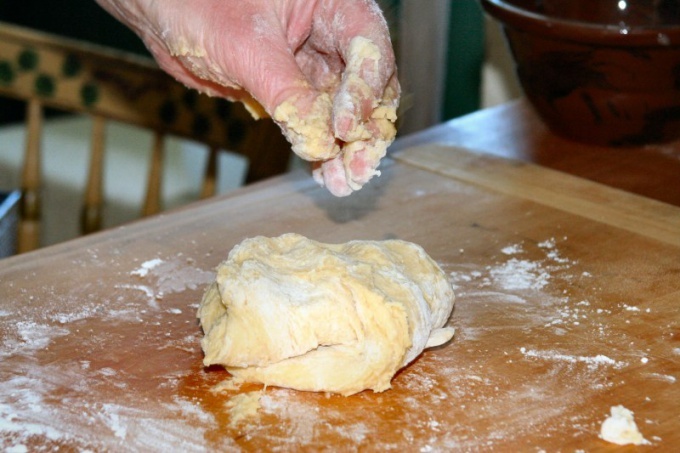 Ensure that in the place where you removed the dough was not draft. Wait until the dough rises. Turn the dough out onto a work surface and ebonite it. Then put it in a bowl, cover with a tea towel again and leave in a warm place. Wait until the dough rises a second time. It will take about the same time as the first. Flour the working surface, place on it the dough and divide into several pieces (6-8). Roll all the pieces into round flat cakes and place in the center of each stuffing. Zasypnica the edges of the tortillas to make a triangle hole in the middle. Allow the cakes to stand, brush the melted butter and put in oven preheated to 190оС. After 20 minutes remove the cakes from the oven, pour into the holes a little hot broth, brush the surface with egg yolk and again get echpochmak another 20 minutes in a hot oven. Remove the patties, pour into holes again in the stock, lubricate the surface with butter, cover the cakes with a linen towel and let stand for 5-10 minutes. Triangles ready.